Many people flocked to the Mini due to the bulk of the "old" iPad models. I understand the desire to go smaller, but the smaller screen size was a turn-off for me. Apparently, Apple listened to my concerns when designing the iPad Air. Who needs an iPad Mini when you have the Air? I’ve owned “the new iPad” (quotes for specificity) since launch day, and I’m able to count the number of days I’ve gone without using it on one hand. Basically, I’m an iPad junkie. It’s replaced my laptop as my primary home device. Other than heavy document editing, I do pretty much everything on my iPad. So when the new iPads were announced a few weeks back, I got excited. Having passed on the most recent model change, I figured it was time to consider an upgrade. My primary beef with my then-current iPad was simply size and weight. And that was only because I’ve held an iPad Mini. Just as it’s hard to un-see what you’ve already seen, it’s difficult to un-feel what you’ve already held. The Mini may have been an eyesore, but the size was perfect. So it only makes sense that I was most looking forward to an updated Mini with a retina display. Then the price tag hammer came down and out went that plan. I figured I’d give the full size model a shot and, boy, I’m glad I did. I understand many people felt the old iPad was too big – bezel, screen, weight, whatever. I agreed on the bezel and weight, but always loved the screen size. I considered the Mini for that reason, and had the price stayed the same, I probably would have waited to order that model. So, naturally, I can now say I’m the proud owner of a brand new iPad Air. Now that I’ve used the Air extensively since launch day, I can say with 100 percent certainty that I made the right decision. 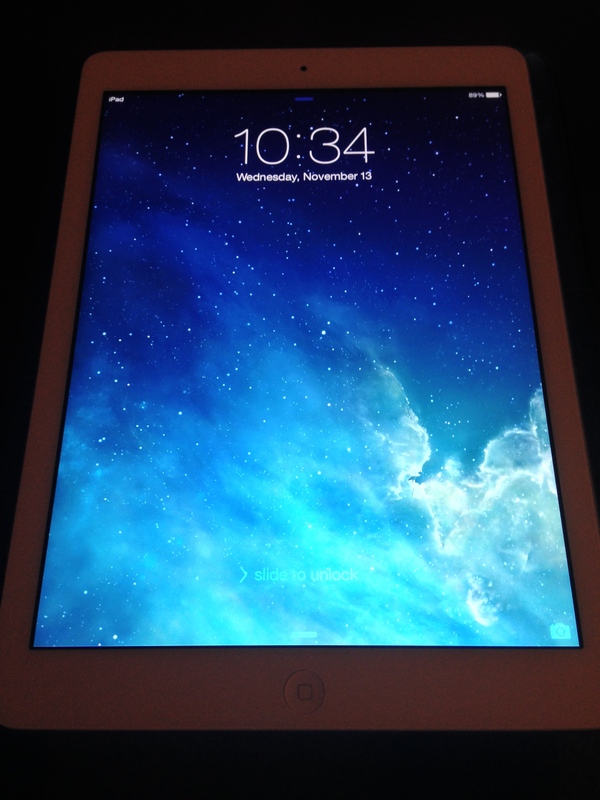 The iPad Air is the latest – and definitely greatest – iPad offering from Apple. That shouldn’t be too big of a surprise given that product lines are expected to improve over time. Regardless, it’s true. The iPad Air just feels right. Yes, that’s a bit cliché, but it seems appropriate given the scope of changes Apple implemented this go-around. You’re not going to be blown away with the under-the-hood improvements, even though they are noticeable and appreciated. There’s no fingerprint sensor or significant camera upgrade. The biggest change is in the iPad itself. It doesn’t feel too bulky or cumbersome to hold. It rests much more comfortably in one hand. Typing in portrait orientation is much easier, even for someone like me with smaller hands. And, bonus, the screen size didn’t shrink. Simply put, this is by far the best iPad Apple has ever released. If you previously shied away from the full-sized edition because of size concerns, I strongly encourage you head to your local Apple Store and play with one for yourself. Have you had a chance to compare the different iPads? Is the iPad Air perfect for you? Or does the Mini better fit your style? I’m buying both. Have the Air. Will have the mini about Thanksgiving. Both 128GB ATT Black. Love the Air. Expect to love the mini Retina too.